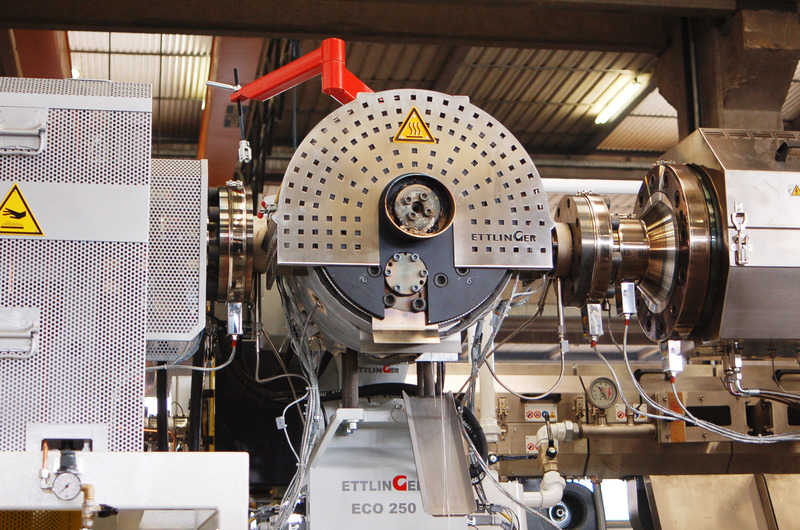 Königsbrunn, Germany, February 2019 – With unprecedented filtration fineness of 60 µm, Ettlinger’s ECO melt filters will in the future make it easier to treat recycled material for the film, packaging tape and fiber industry and help plastics recyclers remove challenging contaminants like paints, silicones, barrier materials, cross-linked fractions and gels from the melt. In particular, the new filter screens will enable cost-efficient conversion of post-consumer PET bottle flake and fines, which generally occur in large amounts, into recycled material with excellent usage properties. Ettlinger Kunststoffmaschinen GmbH was founded in 1983 and today is a global player in the development and manufacture of high performance melt filters and injection molding machines. With its headquarters in Königsbrunn, not far from Augsburg/Germany, Ettlinger has been part of the Maag Group since 2018. Maag is a worldwide leading manufacturer of gear pumps, pelletizing and filtration systems and also pulverizers for sophisticated applications in the synthetic, chemical, petrochemical, pharmaceutical and food industries. Dover is a diversified global manufacturer with annual revenue of approximately $7 billion. We deliver innovative equipment and components, specialty systems, consumable supplies, software and digital solutions, and support services through three operating segments: Engineered Systems, Fluids and Refrigeration & Food Equipment. Dover combines global scale with operational agility to lead the markets we serve. Recognized for our entrepreneurial approach for over 60 years, our team over 24,000 employees takes an ownership mindset, collaborating with customers to redefine what's possible. Headquartered in Downers Grove, Illinois, Dover trades on the New York Stock Exchange under "DOV." Additional information is available at www.dovercorporation.com.